Q. How long does it take to receive my patterns after I place an order? A. 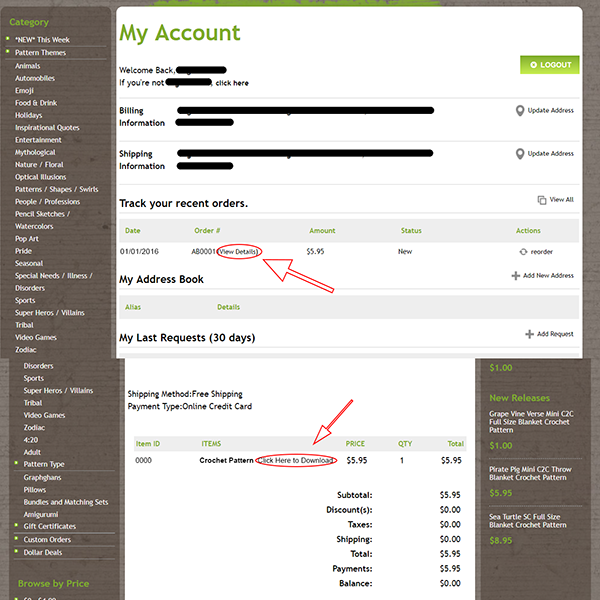 Once payment is received, patterns are delivered to your email immediately. A Download link can be found on your receipt. For custom orders, average time for delivery is 24-72 hours. Q. I don't live in the United States of America, can I still shop from you? A. YES! 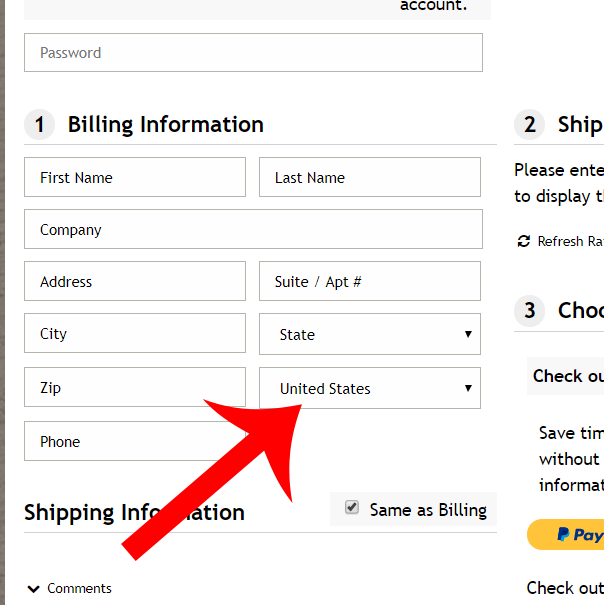 We have many international customers from all over the world, when you get to the checkout page, simply change the country part of your address first and the correct formet for your address will be shown for you to enter the rest of it. Q. Will my patterns be mailed to me through regular post? A. No. All patterns are delivered digitally to your email. Q. How do I know what stitch is used/the size for a graphghan pattern? A. All of our patterns have the stitch used to make them listed in the product name, along with the size for the finished piece. Additionally size measurements are listed in the description for each pattern. Q. What does SC, C2C, Mini C2C, TSS-Right and TSS-Left mean? Q. How do I download my patterns? A. Your pattern(s) will be accessible for 1 year / 365 days via the download link located on the bottom of your receipt as well as through your "My Account" page. 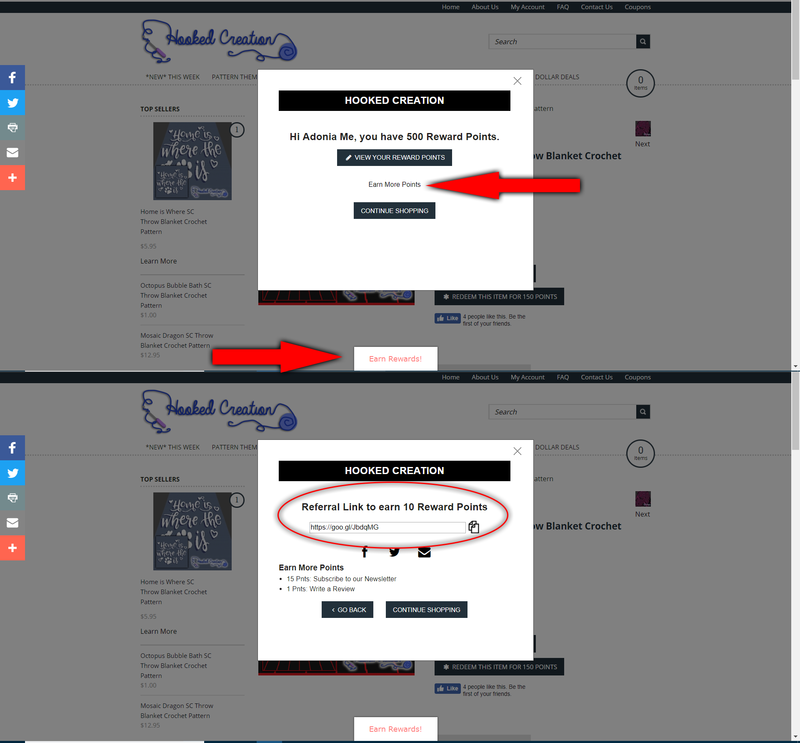 On your my account page, click "View Details" next to your order number, on the following page you will see a link next to each item on that order that says "Click Here to Download"
When you download a product it is recommended that you save the pdf file (not just the link to it) on your device and/or print out your pattern. The patterns are not designed to be available for repeated online viewing. When you click on your download link to retrieve your patterns, the pdf file will open on your screen. At this time all you have done is opened the file. Depending on your device (pc, phone tablet) There will be the option of a SAVE button. 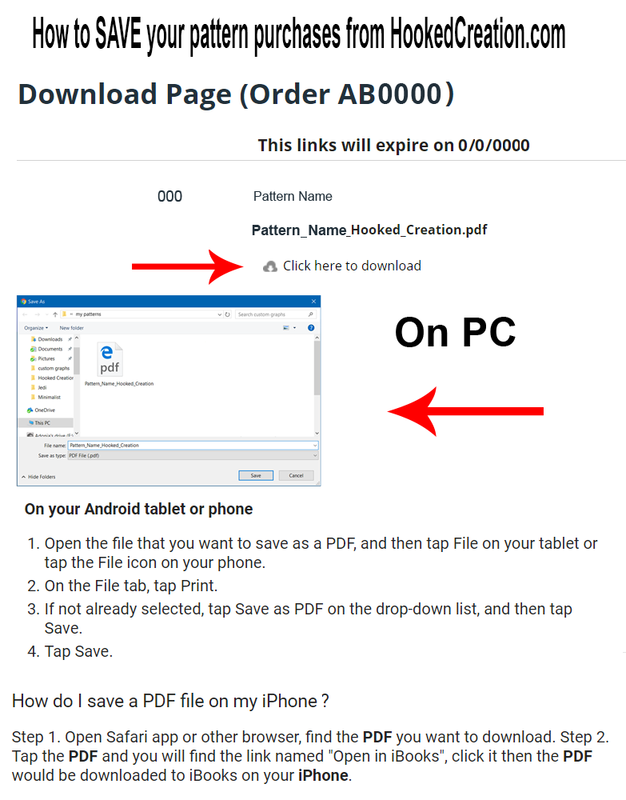 Select a folder detestation to save your pattern to and click save :) Once your pattern is saved to your device you will have unlimited lifetime access to it. Q. My computer crashed / thumb drive broke / phone died / etc. Can I get a replacement copy of my patterns from you? A. Your pattern(s) will be accessible for 1 year / 365 days via the download link on your receipt as well as through your "My Account" page. If you purchase was made more then 365 days ago, simply email us and we will be happy to check your account and manually replace your patterns. Q. Can I cancel my order and get a refund? A. Due to the nature of our products (instant digital downloads), we can only offer refunds (in the form of store credit) if you can prove that a product's description is misleading or incorrect. For products being custom ordered, no refunds are available. Q. Do your graphghan patterns come with written instructions? A. YES! All of our graphghan patterns come complete with full size color with symbols graph, written instructions, and color blocks. So whether you prefer to work from a graph or hate the counting and like it written out for optimum black & white or color printing this pattern has all options. Q. Do your graphghan patterns come with recommended yarn types and amounts? A. All of our patterns also come complete with recommended yarn types, colors and amounts. Amount for each color needed is listed in inches. Q. I accidentally ordered the wrong pattern, can I exchange it for the correct one? A. Unfortunately we cannot do exchanges or refunds for any pattern purchases due to them being instant downloads. Q. When placing a custom order, can I request a yarn pallet other then the choices listed? A. No. It takes approximately 6 hours to load a new yarn brand pallet into our programs for us to be able to best match the colors required for your custom order. This time is not including the amount of time it then takes to make your pattern once the colors are loaded. For this reason we are currently not offering an option to request a new pallet. Q. When placing a custom order, do I get to approve the graph once you make it? A. All custom orders include up to 3 free edits within 30 days of date order was placed. Q. When we order a custom graph from you why afterwards do you list it for sale to the public? A. Because it was placed as a custom order, you got to select the image, the color and yarn choices, the size of the final product, the stitch used to create it, and the time frame it was made available to you within. These are the things that make a "custom order" Occasionally a custom order is placed for a generic item (one that does not have any personal details like someones name, or use of a personal photograph for example on it) Understanding that on average when a custom order is placed the amount of work that goes into your order equals out to an average of $4-$5 per hour - because we have chosen to keep our prices for custom orders extremely low - When this happens the pattern may also be made available to the public. You have not purchased an exclusive rights pattern, thought certainly this is an option if you would like a pattern to made available exclusively to you we are more then happy to sell the copyright for the pattern. This would give you exclusive control over what happens with the pattern as well as the rights to resell it yourself if you wanted to do so. Additionally we also accept "pattern suggestions" vs "custom orders" With a pattern suggestion you are able to make a suggestion for a pattern you would like to be seen made available. You would have no say in the final decision of the size, stitch, yarns types, or time frame that the pattern would be made available by if we even choose to use your suggestion at all. Q. What’s the difference between C2C and Mini C2C? A. Traditional C2C stitches are created using a chain of 6 and 3 double crochet stitches. Mini C2C stitches are created using a chain of 4 and 2 half double crochet stitches. Q. Can a C2C or Mini C2C pattern be done as SC? A. Go to the home page, scroll all the way down to the bottom and you will see a spot to type in your email address to subscribe to our newsletter. Q. What is a Graphghan? A. Simply put, a graphghan is a crochet work 'afghan', which uses the same kind techniques as a cross stitch pattern to create an image: either some simple design like a logo or wording, or less commonly to create an image like a photograph. A. All of our graph patterns include a full size color with symbols graph, written instructions, and color blocks. So whether you prefer to work from a graph or hate the counting and like it written out for optimum black & white or color printing this pattern has all options. Q. Do your Graphghan patterns include how much yarn I will need? A. All of our Graphghan patterns come complete with recommended yarn types, colors and amounts. A. YES we do. If you are interested in becoming an affiliate you can click HERE to sign up or get more information. Q. How much does the affiliate program pay out? A. Affiliate accounts earn 2.5 - 10% on all confirmed sales. Successful affiliates earn more, every affiliate starts at 2.5%. Once you accrue $25 worth of confirmed affiliate sales you will be bumped up to 5%, accrue $100 worth of confirmed affiliate sales you will be bumped up to 10%. Q. How often do affiliate payouts occur? A. Affiliate payouts are processed on the 5th of each month. In order to receive a payout you must have a minimum of $25 accrued worth of confirmed affiliate sales. Payments are made via paypal (immediate access to your funds) , or money order (sent via snail mail). We will contact you once you have accrued enough to receive a payout so that you can select your preferred method of receiving payment. Q. What are Rewards, and how do they work? Reward point are valid for 1 (one) year (365 days) from the time they are earned. Points may be redeemed for free patterns. Each pattern on our site lists how many reward points are needed to redeem them. To use your reward points toward an item simple go to the product page and click *Redeem this item for *** points. Q. How do I redeem Reward Points? A. Log into you account. 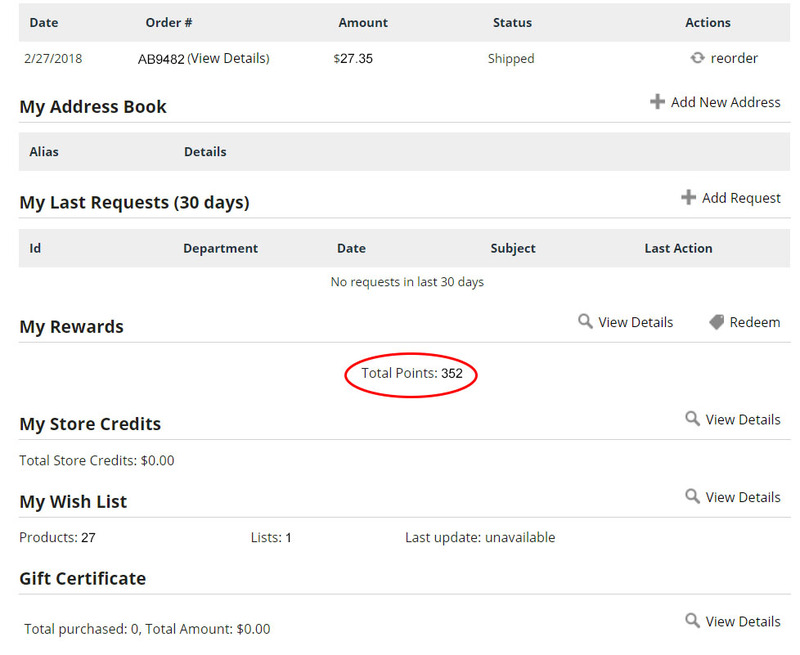 On your "My Account Page" you can view your total available reward points. Q. 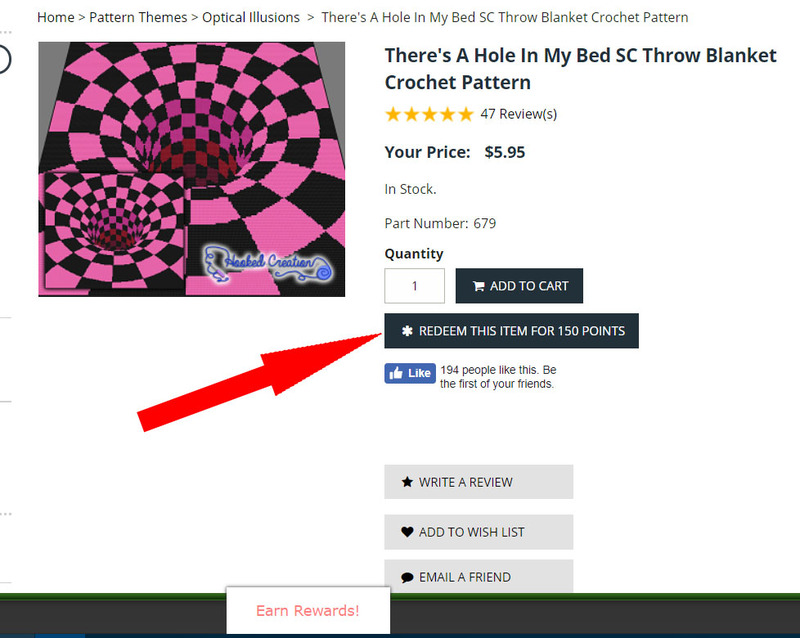 The pattern I purchased said it was worth ** Reward Points, why did I receive less ? A. Reward points are issued as $1 = 1 Point. If you use a coupon code you total amount changes there for your total point issued also changes. Q. How do I find my referral link? Q. I am having issues adding items to my Wishlist, why won't it work? A. The wish list feature is not compatible with Firefox, to use the wishlist feature please try Chrome or IE. Do you have another question you don't see here? Feel free to contact us.